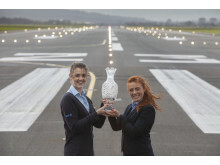 Glasgow Airport employees Sarah Hopkins (L) and Chantelle Docherty with the Solheim Cup trophy on the runway at Glasgow Airport. Glasgow Airport has been announced as an official sponsor of The 2019 Solheim Cup, taking place at Gleneagles from September 9th-15th, 2019. Joe FitzPatrick, Minister for Public Health, Sport and Wellbeing, said: “Scotland is famous for its warm welcome and with Glasgow Airport as an official sponsor, the golfers, officials and thousands of fans set to land here in September are guaranteed a memorable first impression. 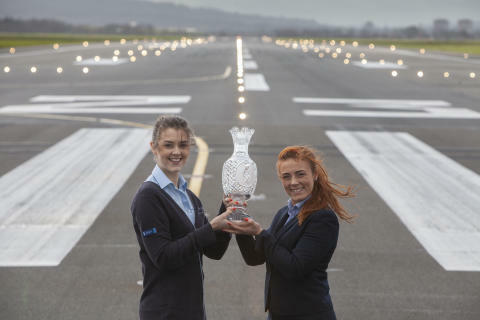 Francois Bourienne, Chief Commercial Officer for AGS Airports Ltd, owners of Glasgow Airport, said: “We are thrilled to come on board as an official sponsor of The 2019 Solheim Cup. The Solheim Cup combines the tradition and prestige of the game of golf with passion for one’s country and continent. This biennial, trans-Atlantic team match-play competition features the best European players from the Ladies European Tour (LET) and the best U.S. players from the Ladies Professional Golf Association (LPGA) Tour. The Solheim Cup is named in honour of Karsten Solheim, the founder of Karsten Manufacturing Corporation, which makes PING golf equipment. In 1990, the Solheim family, in conjunction with the LET and the LPGA, developed the concept and became the title sponsor for the Solheim Cup, professional golf’s international match-play competition for women. Today, the global partners of The Solheim Cup are PING, Scotland, The Home of Golf, and Rolex. Held every two years, the event has grown into the most prestigious international women’s professional golf team event. The Solheim Cup is the most highly coveted trophy in women’s professional golf team competition; some of the most memorable moments in the sport have happened during past Solheim Cups and berths on the European and U.S. teams are highly sought-after by players from both organisations. The 2017 Solheim Cup took place on August 14-20, at Des Moines Country Club in Iowa, United States. The U.S. Team retained the coveted Waterford Crystal trophy by 16 ½ to 11 ½ points. 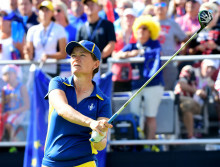 For more information log on to www.solheimcup.com. EventScotland is a team within VisitScotland’s Events Directorate, the national tourism organisation which markets Scotland as a tourism destination across the world, gives support to the tourism industry and brings sustainable tourism growth to Scotland. For more information about VisitScotland see www.visitscotland.org or for consumer information on Scotland as a visitor destination see www.visitscotland.com. IMG is a global leader in sports, fashion, events and media, operating in more than 30 countries. The company manages some of the world’s greatest sports figures and fashion icons; stages hundreds of live events and branded entertainment experiences annually; and is a leading independent producer and distributor of sports and entertainment media. 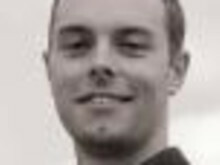 IMG also specializes in sports training and league development, as well as marketing, media and licensing for brands, sports organizations and collegiate institutions. IMG is part of the Endeavor network. The Ladies European Tour (LET) celebrates women’s professional golf on a global stage. In 2017, the schedule features tournaments across five continents, including The Solheim Cup, with a diverse membership of 324 professional golfers representing 38 countries worldwide. Since its formation in 1978, the Ladies European Tour has witnessed 248 different winners celebrate a total of 719 championship titles between them, and has celebrated its diversity as players from 28 different countries have won on the Tour. The Ladies European Tour broadcasts live coverage of its tournaments to more than 304 million homes in more than 116 countries every week, generating 425 global broadcast hours per tournament. It also enjoys the support of many of the world’s leading business brands. The Ladies European Tour also manages the LET Access Series, which is its official developmental tour, formed to give players not part of any major Tour the opportunity to compete and progress onto the LET. The top five players on the 2017 LETAS Order of Merit will earn membership of the Ladies European Tour for 2018. Located one hour from Glasgow and Edinburgh, The Gleneagles Hotel is set in an 850-acre estate, with its own railway station just minutes away. Gleneagles is synonymous with golf, and home to three championship golf courses - The PGA Centenary Course - venue for the Ryder Cup 2014 - and the stunning King's and Queen's Courses. But there’s even more to keep guests entertained off the course: a choice of more than twenty activities can be found in the grounds, from clay target shooting, archery and trout fishing on three lochs within the resort’s estate, to horse-riding, Segway tours and gun dog training. Throughout the hotel you will find the finest comfort – from its 232 luxury bedrooms and suites, to the calming environment of the spacious destination spa by ESPA, home to one of only two ESPA Life wellness centres in the world. Gourmands will have plenty to discover, with four on-site restaurants, including Scotland’s only two Michelin-starred restaurant Andrew Fairlie. Ticket sales launched for The 2019 Solheim Cup at Gleneagles, 11th to 15th September. Scotland is celebrating becoming the next host nation of The Solheim Cup following the official handover to Gleneagles at the culmination of the 2017 event at Des Moines Golf & Country Club in Iowa.